Weary residents who have battled a relentless push by developers to weaken Rockville's Adequate Public Facilities Standards (APFS) on schools often said the issue would keep coming back until the developers prevailed. That happened last night, when the Rockville City Council voted 3-2 to align its school capacity standards with those of Montgomery County. Those standards include allowing capacity to reach 120% (but in reality, MCPS allows individual schools to far exceed even that weaker cap), and to measure overcapacity by cluster, rather than the stricter school-by-school count the city had until last night. The vote sets up not only a slew of new residential development in the city, but also the battleground for this fall's city elections. 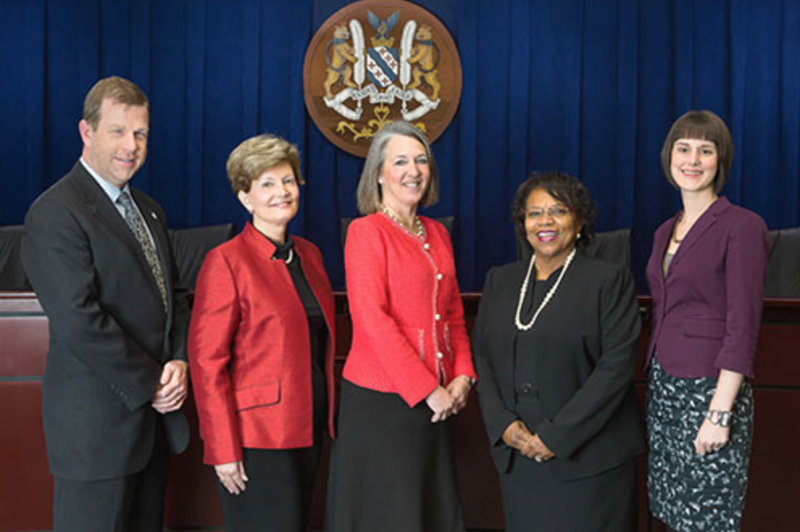 Three-fourths of the winning 2013 Team Rockville slate - Councilmembers Tom Moore, Virginia Onley and Julie Palakovich Carr - voted to pass the resolution that had previously been withdrawn by Moore at the Mayor and Council's February 9 meeting. "We need to work with developers"
Both Onley and Moore used hyperbolic language in their arguments, threatening that Rockville would become a "ghost town" if the resolution did not pass. Onley said the change would be a "win-win for the city," allowing a potential 77 affordable housing units to be built in separate projects proposed by developers EYA and Avalon Bay. Palakovich Carr said she was voting with her 3-month-old son's future in mind, saying "funding has been slow to materialize" for new schools under the 2005 APFS standards. Mayor Bridget Donnell Newton and Councilmember Beryl Feinberg both dissented in the vote, arguing that the issues of school construction and the APFS are more complicated. Newton said public facilities go far beyond schools, and include traffic capacity, services and other infrastructure that would not be covered by Moore's resolution. Feinberg countered the arguments by Moore and Onley which centered on the potential boon of impact taxes to be collected from new development. There was no guarantee that money would be spent in Rockville, Feinberg noted. "It doesn't mean you get the school any faster," she argued. "If it's not working at the county level," she asked, why adopt that policy in Rockville? Feinberg also suggested that the recession was more likely to blame for lower school construction funds than the APFS. Newton preferred to pursue other avenues rather than simply weakening the Rockville standards. She suggested the city attempt to have new schools funded by payments directly from developers who want to build projects, for example. Taxpayers are also "upset" over ever-rising county and state taxes, she warned, saying "You can't get blood from a turnip." The 90-minute debate found proponents of weakening the APFS making some surprisingly odd arguments that could come back to haunt them in November. For example, Moore sounded unconcerned - and Palakovich Carr praised - the bane of MCPS parents countywide - portable classroom trailers. Palakovich Carr said portables have not impacted the quality of education in the county, an assertion that would likely invite dissenting remarks at any county PTA meeting. Portables keep class sizes small, she said. Moore said the city retains control of traffic issues - but is that true, given that many of the congested roads are actually under the control of the state? The city cannot control the timetable or extent of state highway projects, as Montgomery County officials can tell you. Other arguments made were equally unsupported by the evidence. For example, yes, MCPS has a 120% cap on overcrowding. But averaging by cluster allows individual schools to far exceed that cap. The 5-year test allows MCPS to permit development for which school capacity actually never gets constructed, using what Rockville Planning Commissioner Jack Leiderman correctly termed "paper schools". Adopting the MCPS standards, Leiderman argued last year, will allow overcrowding to reach or exceed 180%, far above 110% or the county's supposed 120% "cap". Moore called the 2005 APFS measure a "failed experiment." But is it? The wealthiest neighborhoods in Montgomery County, by contrast, are still waiting for construction of a new elementary school. One is not even in the planning process - much less coming online - in 2019 in the Westbard area, currently targeted for massive infill development by the county. Finally, the APFS has indeed prevented excess development from further overcrowding schools; other parts of the county haven't had that safeguard. As Montgomery County's record of building booms and budget shortfalls prove, development absolutely does not equal what Palakovich Carr termed "a huge windfall." She said new residents will fund services for existing residents. But who will pay for the services for those new residents? It's great to favor adding housing units, but every one of those units carries a cost in transportation, water and sewer, police and fire, city services and - yes - public education. Hence, MoCo's structural budget deficit, which has County Executive Ike Leggett warning of a property tax increase next year. Wait a minute, I thought massive development generated revenue, you might be asking? Wrong. Moore - dismissing the overwhelming opposition to his resolution by citizens at public hearings - said, "our job is not to count heads," or to "listen to the angriest...voices at the end of a public hearing." But who are the "angriest voices" in Rockville on the APFS? Those angry voices arguably belong to developers frustrated by the common sense 2005 APFS standards, and the elected members of the Montgomery County Council who collect campaign checks from them. Those have been the angry voices, who eventually threatened the city to change - "or else." This is but the latest twist in a disturbingly tone-deaf approach to development being taken by those County Council members, and the Montgomery County Planning Department. Tired of arguing with residents whose neighborhoods are threatened by the real consequences of infill development, they've adopted a "development at all costs", ram-it-through approach. Urbanizing the suburbs? "Shut up! It's smart growth." Traffic? "Don't count it." Portable classrooms? "Bring 'em on - we love 'em, teachers love 'em, and so do the kids." Overcrowded schools, and schools without playgrounds or other facilities? "Stop whining, you big baby." Devastated. How can our elected officials turn their backs on voters, citizens and our children?! We MUST vote them (Moore, Palakovich-Car and Onley) out of office in November. But far more concerning is the deferment to a system which has proven to yield far worse results, with abyssmal overcrowding issues. Really? I am used to exploring and considering places and systems beyond MOCO (ie. Who is succeeding where we are foundering, and what are they doing right?) for trouble-shooting to improve what we have. APFS results may have been far from perfect, but if anything, it should be MOCO rising to APFS standards, not the other way around. Robert Dyer, you are both visionary and pragmatist with keen insight and a priority for community welfare. You may have lost the last At-Large election, but your name, voice and presence were consistently unmentioned by the Post, radio, and TV throughout the campaign. All most folks knew was that you ran on a Republican ticket, without ever realizing that you are no run-of-the-mill Republican. When it comes to community planning and development and critical strategist skills, I don't know anyone currently on County Council who would be more capable. Every official has a starting point; you have the aptitude, knowledge, skills and heart to find wise solutions for the development issues this county faces. Please, Sir: Don't ever let your hope grow dim, or believe that the possibility to forge a more beautiful future is obselete. I believe in your politics, and I believe in you. I will be backing you in 2018, so "Give 'em hell, Robert!" Wow, I don’t know Mr. Dyer but that is quite an endorsement. I am intrigued. As far as the APFO change, how does a condo project in Twinbrook and/or Tower Oaks bring more people to Town Center? Neither of these projects are in TC and the problem with TC isn't lack of people living in TC. I hope the people who spoke out against the APFO can muster some good candidates for City Council and vote these 3 out! Voters have short memories though.